There are lots of people trying to steal your lunch money. Will you rise to challenge and make 2017 your best year yet? Or will you fall into the abyss of retail irrelavance? You decide. For a multitude of reasons, shoppers' busy path-to-purchase grows ever more complex. But the ‘cure-all’ might be simpler than you think. Back-to-school shopping is around the corner. Marketers everywhere are strategizing for the second busiest retail season of the year. As the retail environment continues to fracture, savvy marketing teams are looking for any possible edge. Usually, that edge comes down to one thing — Driving Qualified Traffic. A brand's ability to drive visitors online and in-store separates winners from losers. But knowing where to focus to drive that traffic is the 'holy grail' for retailers. Devices, channels, and platforms multiply like a virus. And so do your competitors, during a time when the threat of new entrants has never been so high. In 2016, back-to-school shoppers spent nearly $76B – up from $68B in 2015. And early growth indicators – like a strong US economy – suggest spending this year will be up yet again. DemandJump wanted to go deep on how best to capture and convert traffic in 2017. Here’s what we learned. Well, of course. You know this. But did you know it could be the number one one reason for getting BTS shoppers into your store or on your website? 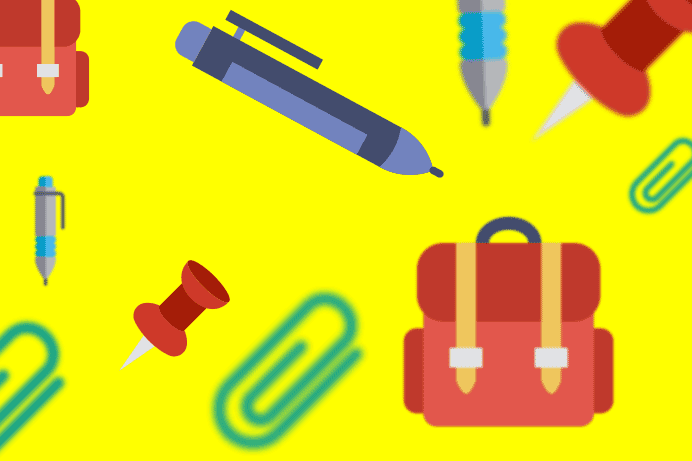 Search data from DemandJump’s artificial intelligence marketing platform revealed that many top organic (and paid) search terms for back-to-school included words like ‘coupon’, ‘sale’, ‘deal’ and ‘discount’. In fact, of the top 20 BTS-labeled search terms, 40% made some type of discount statement. Whether you're a discount retailer or not, you can set yourself at the top of shoppers' consideration by leveraging this kind of messaging. For many BTS retailers, it's not just a good strategy; it's the only way to get customers through your door. 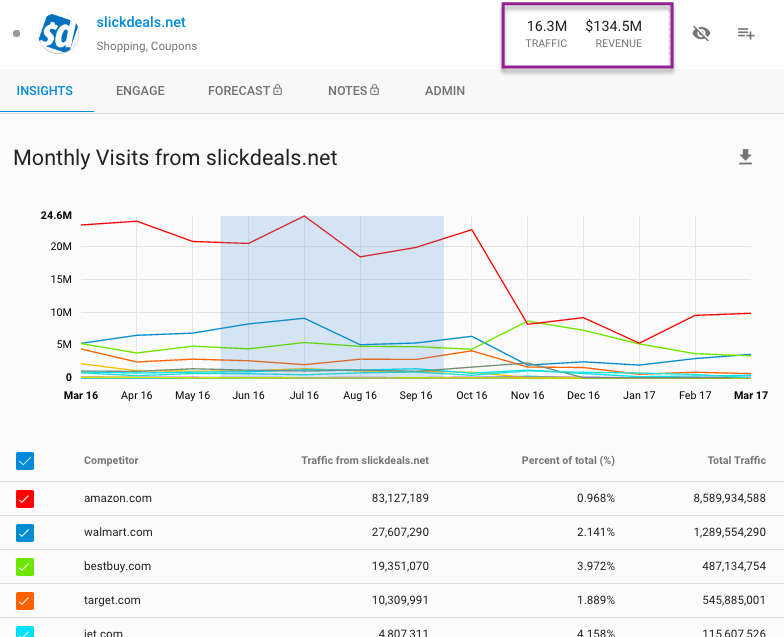 DemandJump’s platform confirmed interesting traffic patterns from affiliates — a lucrative source of revenue for BTS retailers. DemandJump insights reveal that back-to-school season with affiliates starts as early as June, peaks in July, and often carries a long tail through September (possibly due to gift cards purchased during the BTS season, or exchanges made once the school year begins. To win during this critical time of year, back-to-school retailers should focus on generating traffic with discounts and powerful, value-based messaging. More than ever, mobile is an essential part of the customer journey. Retailers should leverage mobile to win micro-moments through product reviews, tutorials, and easy, mobile purchasing options. Still, mobile is not often the last stop in a buyer’s journey. Understand its role to your customers, and how mobile strategy fits into your overall marketing mix. When done properly, it will be critical in winning foot traffic, website traffic, and sales. According to Google, brands like Best Buy and Target are using mobile to draw customers into stores and seeing a large lift in store visits and sales as a result. 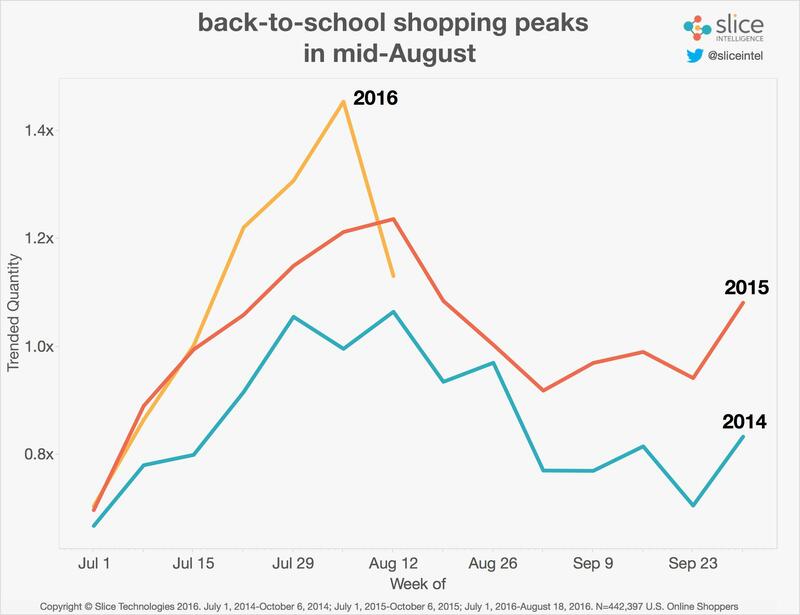 Data from Google Trends tells us consumers are starting to shop for back-to-school earlier than ever before. Last year, 22% of K-12 shopper started at least 60 days before the first day of school, compared to 19.6% two years ago. And back-to-college shoppers were starting even earlier. By the time we’re one month out, expect more than 75% of consumers to have started shopping. For retailers, this means tweaking your strategies to start generating BTS traffic as early as June 1. And if you aren’t totally ready to play by the first of July, don’t even bother showing up. We mentioned mobile in the last section. This is a critical part of your back-to-school strategy that must be ready to deploy as soon as possible. 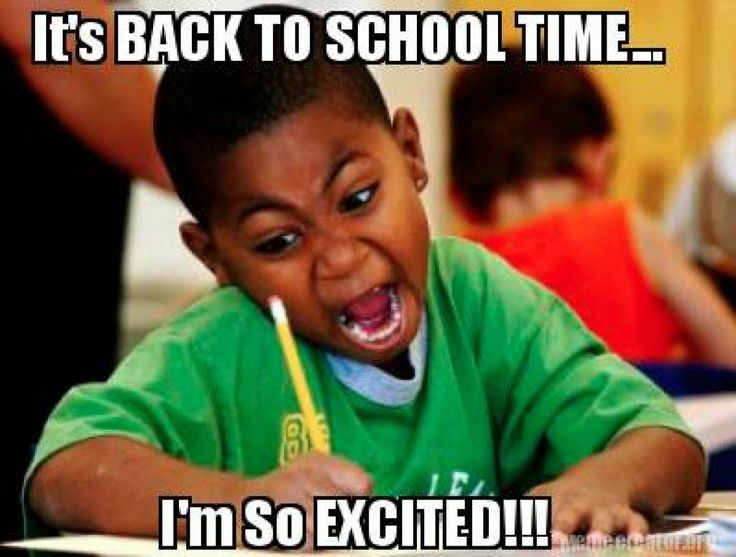 Google Search data tells us that 3/5 back-to-school related searches during July happen on a mobile device. Therefore, winning mobile early on could mean winning the season. Driving traffic is difficult. After you’ve put in all the hard work – being there during micro-moments, thinking mobile-first, having the right discounts in place – why blow the sale on something dumb? Research from the NRF suggests that free shipping isn’t just ‘nice to have’ – it’s ‘need to have’. 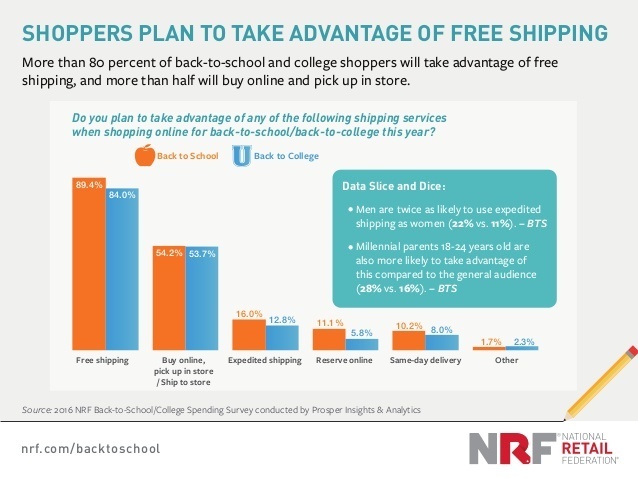 Nearly 90% of back-to-school shoppers planned to take advantage of free shipping in 2016. And with free shipping becoming the norm at eCommerce beasts like Amazon and Zappos, all retailers are facing continual pressure to offer the same. Now, even small shipping fees can be the difference between a successful conversion and losing another customer to Amazon. Back-to-school is a critical time of year for retailers. As the second busiest shopping season, it can leave a big impact on a retailer’s bottom line. *Google Search data, U.S., Jan. 2013–Jul. 2016.